A person came across a problem where they had written content for their website in Microsoft Word, copied it & then pasted the data DIRECTLY INTO THEIR WEBSITE. Sometimes it looks alright & other times it could look really weird with different fonts, special characters or symbols; it just stuffs up your formatting. Why does Word affect your content? Although you can’t see it, when you copy/paste out of Word you take a whole bunch of hidden formatting bits & pieces. But don’t freak, there’s an easy way to fix this! Notepad is a text editor that should be already installed on your Windows computer. It’s used for editing plain text files & for our purposes we are using it as a “dumping ground” to get rid of any hidden formatting issues that we copied out of Word. 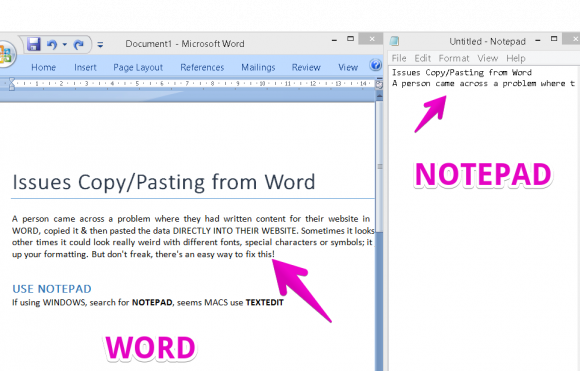 Now comes the fun part … COPY the content from Word & paste it into Notepad. 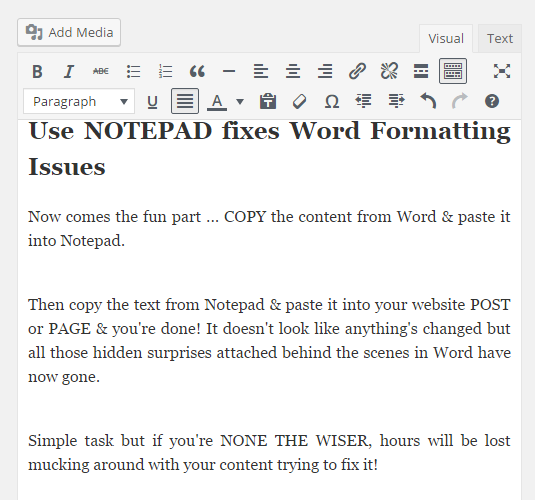 Then copy the text out of Notepad & paste it into your website POST or PAGE & you’re done! It doesn’t look like anything’s changed but all those hidden surprises attached behind the scenes in your Word document have now gone. Simple task but if you’re NONE THE WISER, hours will be lost mucking around trying to fix your content unnecessarily!